Clyde Walter has been a member at Messiah Lutheran for his entire life. What Clyde enjoys most about attending Messiah is worshiping God, learning more about him, and interacting with other Christians. Clyde is a regular attendee at Messiah Lutheran and is a part of the XYZ (Extra Years of Zest) group. Clyde has formerly served on the church council and is an active member of our Properties committee and Men in Mission team. Clyde is often seen dedicating his time and talents around the church grounds keeping up with necessary repairs and general maintenance. 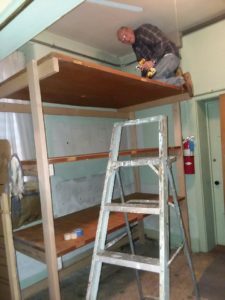 He was the Chair of the Parsonage Renovation Project in 2014 and has recently spent time on various carpentry and painting projects at Messiah Lutheran. Aside from the countless hours of dedication to our church’s buildings and grounds, Clyde is often a regular volunteer at Luther’s Cafe, church dinners, 4th of July food stands, New Berlin Day, and our yearly Mother/Daughter banquet. Clyde has also helped construct a float for Messiah to be driven through the parade route at the New Berlin Fireman’s Parade. Clyde is a Worship assistant volunteering his time as a greeter, altar guild, and providing tasty snacks along side his wife Diane as a fellowship host. We are very grateful to have such a dedicated member in Clyde and can’t thank him enough for all of the work he has and will continue to do in our congregation! Frances Blatchley has been a part of Messiah’s congregation for the past 24 years. 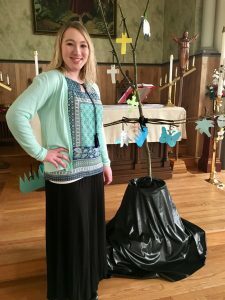 What Frannie likes most about Messiah Lutheran is that there are so many gifted people in the congregation and they all freely share their gifts and talents. Most recently Frannie has enjoyed working in our church’s garden to help provide fresh produce for Messiah’s Harvest Table, a produce-sharing ministry that is free to the public and a blessing to many. On any given Sunday, Frannie is typically first to arrive prior to service to ensure that the doors are open and everything is in place for worship. Frannie frequently serves as an offering bearer, lector, altar guild, communion assistant, and enjoys hosting our fellowship hour following service. During Messiah events, you will likely see Frannie in attendance. Through her volunteerism at Luther’s Cafe, church dinners, 4th of July and New Berlin Day food stands, Vacation Bible School, Mother/daughter banquets, and our community yard sales, Frannie is an ever-permanent fixture of our outreach. 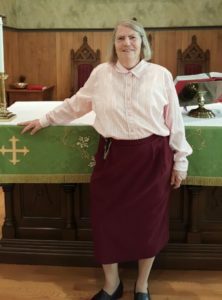 Frannie is a member of our Knit-Wits and Quilt Tying clubs, participates in the church choir, serves on the Worship and Music committee, and is a member of WELCA (Women of the Evangelical Lutheran Church in America). She also enjoys attending our annual congregational picnic and Rally Day event. Her commitment to the church does not go unnoticed. We are grateful for our “Saint” Frances and thank her for her dedication and commitment to our faith community. Thank you, Frannie! 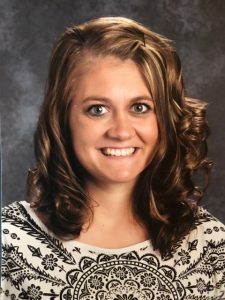 Katie Mitchell has attended Messiah Lutheran since birth and has become a strong leader in our congregation. When Katie thinks about Messiah she thinks about laughter, smiles, singing, greetings, and most of all; the fellowship that is shared. Katie loves the mission of our church, the ways we reach out to the community and support each other, and the way we spread God’s word to others. Katie is a regular attendee of our Sunday services and currently serves on the church council. On Sundays she can be seen volunteering as a greeter, altar guild, communion assistant, offering bearer, fellowship host, and is also a great mentor to our youth as a Sunday School Teacher. Most recently Katie coordinated our Vacation Bible School program which was a great success reaching the lives of 30 children and filling their hearts with God’s word. Katie is also involved in the planning of our annual Rally Day and various children’s musicals. She enjoys being a part of church events such as Luther’s Café, church dinners, the Mother/Daughter banquet, and the yearly congregational picnic. We are so happy to have Katie as a part of our congregation! You are such an example of God’s love and grace and we are excited to see how God will continue to work through you! Jillian Fee grew up attending Messiah Lutheran Church and is very active in the congregation. What she enjoys most about worshiping at Messiah is the sense of family that she feels from the other members of the church. Jillian serves as an acolyte and offering bearer during worship and has been a part of the children’s musicals over the years. She participates in our church’s Rally Day and Mother/Daughter Banquet and helps out at various church events such as our church dinners, food stands, and the community yard sales. This year Jillian is working on achieving the Girl Scout GOLD Award and has chosen the difficult task of organizing the church’s yard sale room as her GOLD Award project. Thanks to her efforts, this year’s yard sale preparations were a lot easier! Jillian has also attended Camp Mount Luther every year and is excited for her opportunity to complete an internship program with the camp this summer. Thank you Jillian for all that you do to serve our Lord and Savior Jesus Christ! May God be with you throughout your life’s journey!